There are many benefits to eating fish, but anglers should be aware that some fish have mercury, dioxin, PCBs or other chemicals in them that can be bad for your health if you eat too many. 1. Choose – A general rule of thumb is to remember S.A.F.E.Smaller fish are usually a good choice, Avoid large predator fish and bottom-feeders, Fat should be removed, Eat fish that have been broiled or grilled on a rack. 2. Clean – Learn about cleaning techniques (including trimming as much fat from the fish as possible) to help remove chemicals from the fish. 3. Cook – Discover cooking techniques that can be used to remove even more chemicals from the fish. Be informed and check out the Eat Safe Fish Guide to help protect yourself and your family from chemicals that could someday make you sick. For more information, visit www.michigan.gov/eatsafefish and then click on the “Going Fishing?” button. The Fisheries Division is now producing a quarterly outreach publication for anglers: Reel in Michigan’s Fisheries. This publication will showcase waters that are actively managed and provide the public with enhanced knowledge and the opportunity to access information contained in survey reviews and management reports. 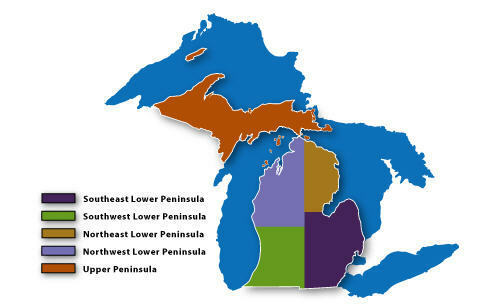 The quarterly publication can be found at: www.michigan.gov/dnr/0,4570,7-153-10364-306572--,00.html. Lake Erie: Had a large mayfly hatch. Walleye fishing was slow in Michigan waters. Those heading out to Ohio waters caught fish around West Sister Island. Perch fishing was good in Brest Bay in 18 to 20 feet or off Toledo Beach in 15 feet. Anglers are trolling orange, copper and purple spoons or crawler harnesses in 19 to 23 feet of water between Stony Point and the River Raisin. Catch rates were inconsistent but anglers were taking fish. Huron River: Bass are being caught from Dexter to Ypsilanti. Detroit River: White bass are still being caught in the upper river although the peak of the run is over. Smallmouth and largemouth bass are also being caught. Lake St. Clair: Had very good walleye fishing around the shipping channel, the Dumping Grounds and off the 400 Club. Most are using crawler harnesses. St. Clair River: Also had very good walleye fishing for those using crawler harnesses and bottom bouncers. Walleye were caught near the Blue Water Bridge. Lexington: Is producing a good number of white bass. Port Sanilac: Is producing some perch along the weed beds. A few fish were up near 16 inches. Harbor Beach: Has produced some nice salmon and steelhead in the top 50 feet of waters 150 to 220 feet deep. Try spoons off downriggers or 5 and 10 color lead lines with offshore boards. Hot colors were orange or glow with black as well as silver and black screwballs. Use regular or magnum spoons. Lake trout fishing is good in 80 to 120 feet with dodgers and spin-glows or spoons just off the bottom. Brown trout are still close to shore in 30 to 40 feet. Try long lines with bright colored spoons or body baits. A few walleye were caught on body baits. Bass and pike can be found in the harbor. For perch, try inside the harbor or south near the cemetery. Port Austin: Walleye fishing is just getting started with a few fish taken off the reefs. As the water continues to warm, walleye fishing off the tip of the Thumb will improve. Pier anglers are taking a few walleye near dusk and after dark. Saginaw Bay: Has excellent walleye fishing from Au Gres to Sand Point. Limit catches are common. Crawler harnesses are working everywhere but some are starting to use Hot-n-Tots or spoons. Excellent fishing was noted off the Pinconning Bar, Gambil’s Marina, Linwood, the Spark Plug, the Callahan Reef, the Coryeon Reef, the Slot between Quanicassee and North Island, the Bar, Wildfowl Bay and off the mouth of the Kawkawlin and the Saginaw Rivers. While lots of fish are being caught, plan to catch about one sub-legal fish for every keeper. Saginaw River: Walleye have been caught in the lower river by those trolling Hot-n-Tots between the mouth and the Coast Guard Station. This is a good option for those that with smaller boats that might not be able to get out on the open water. St. Joseph: Overall fishing has been slow. Boat anglers are targeting waters 60 to 300 feet deep. Pier anglers have caught the occasional steelhead. Alewife and shrimp worked best. Perch fishing was also slow as the fish were scattered in 20 to 65 feet of water. South Haven: Had slow catch rates for boat and pier anglers. Boats were fishing anywhere from 40 feet to 250 feet or more. Perch fishing is slow. Kalamazoo River: Those fishing upstream of Marshall caught pike and bass. Holland: Pier anglers are still catching an occasional steelhead when floating shrimp under a bobber. Some are targeting freshwater drum just for the fun of it. Grand Haven: Boat anglers are struggling for salmon. Pier anglers have caught a handful of perch when using small minnows or alewife. The perch are small, six to eight inches. Grand River at Grand Rapids: Smallmouth bass are hitting on crawlers, leeches, spinners and tube baits. Channel cats are hitting on chicken liver, crawlers, leeches and cut bait. For flatheads, go with live bluegills or suckers. A few pike were caught by those casting body baits, spinners or sucker minnows. Grand River at Lansing: Is producing some catfish. Try live or cut bait. Jackson County: Inland lakes were producing near limit catches of panfish along with some bass and pike. Calhoun County: Duck Lake was producing nice panfish including redear sunfish and crappie. Nottawa Lake was giving up some nice panfish and a few bass. Word has it no pike have been caught this year. Branch County: Lake Lavine was producing bluegills. Union Lake and Marble Lake were good for bass. Muskegon River: Had very good trout fishing below Croton Dam. Whitehall: Is producing some coho, steelhead and lake trout. Try copper, dipsey’s and green flashers. Pier and channel anglers caught freshwater drum. White Lake: Anglers were catching a good number of bass. Green and chartreuse worked well in the weeds or black and yellow near the lilies. Burt Lake: Has been good for walleye. Mullett Lake: Is producing walleye. Try crawler harnesses or rapalas. Rogers City: Is producing decent numbers of lake trout however some of the fish were smaller. Try Adams Point, Forty Mile Point and Sea Gull Point with cowbells and dodgers with spin-glows or spoons near the bottom. Chinook, steelhead and the occasional Atlantic salmon are starting to show up. No big numbers yet but anglers should find a fish or two. Try west towards Forty Mile Point, off the State Park or south towards Adams Point 25 to 75 feet down in 60 to 120 feet of water. Hot colors were green, blue, orange and green or silver. Glow or darker colors were good early or late. Presque Isle: Has a good number of lake trout however they seem to be shallow one day and out deeper the next. Try cowbells or dodgers with spin-glows when high lining in the shallows or fishing just off the bottom out deeper. Chinook and salmon are starting to show up. The hot spots were straight out from the Red Can and west between the two lighthouses about 30 to 80 feet down in 60 to 120 feet. Hot colors were green and silver, blue and silver, orange and green or blue and green. Rockport: Those looking for lake trout were fishing in 70 to 100 feet around Middle Island. Flashers or dodgers with spin-glows did catch a few lake trout. Chinook and Atlantic salmon were rare but a few were caught. Walleye anglers did not have much luck but a few did take some nice fish. Grand Lake: Had decent walleye fishing. Alpena: Catch rates were spotty for walleye. Those trolling crawler harnesses did catch a few fish. Blade colors did not make a difference. A few fish were caught on pink and purple crank baits. Lake trout were caught around the ship wrecks. Try spoons or spin-glows behind flashers and dodgers in 70 to 100 feet of water. A couple pink salmon were also caught. Thunder Bay River: Was very slow during the day with only a couple freshwater drum or smallmouth bass caught. Those fishing at night did best for walleye. Harrisville: Fishing has turned into a guessing game. Lake trout have been caught in waters as shallow as 30 feet or deeper in 100 feet. Steelhead and salmon were found in 40 to 70 feet. The only certain thing is the fish are suspended and all seem to be chasing the same colors of blue, orange, white and silver. Planer boards with lead core worked best. Walleye were caught near the lighthouse in 12 to 20 feet with crawler harnesses or body baits. Oscoda: Lake trout and steelhead are coming in, but few and far between. Lake trout should be in 60 to 100 feet of water and steelhead should be in 50 to 70 feet. Look for the scum lines. Au Sable River: Walleye seem to be the biggest draw. Early morning and late evening were best when using crawlers, leeches and body baits. Steelhead are still making their way up into the river. Anglers reported fish on the beds near the Boy Scout Camp and High Banks or the deeper holes by the Whirlpool. Tawas: Those trolling around Buoy #2 and beyond in 30 to 70 feet of water are taking good numbers of walleye. Smallmouth bass and the occasional walleye were caught inside the bay. Pier anglers caught a few bass and pike. Tawas River: Shore anglers are getting catfish and freshwater drum. Au Gres: Is most likely the busiest port on Saginaw Bay right now. A lot of boats are catching a lot of walleye. Most of the action has been between Pointe Au Gres and Point Lookout however some are heading north toward Alabaster or south. They are taking limit catches in 30 to 40 feet of water. Au Gres River: Had slow catch rates with only a few catfish taken. Harbor Springs: Lake trout were caught 50 feet down with spoons, cowbells and dodgers around Harbor Point. Many were sub-legal. A good number of smallmouth bass have been caught on tube baits and crank baits around the docks or on the Harbor Springs side of the State Park. Some caught cisco right off the bass beds. Petoskey: Boat anglers did not find the salmon. Lake trout fishing was best in front of Bay Harbor and near the breakwall. Try 80 feet down in 130 feet of water with spoons. Steelhead and freshwater drum were also caught. Pier anglers did manage to catch a couple walleye off the D Pier. One was caught on a crawler and the other on a jig with a twisty tail. Smallmouth bass, rock bass, freshwater drum and carp have also been caught. Bear River: Had few anglers. Steelhead were caught on spawn up near the dam. Charlevoix: Is producing lake trout near Nine Mile Point. The fish are suspended or near the bottom along the shelves. Try 50 to 80 feet of water with spin-glows, spoons or green p-nuts. Fish were also marked in 200 feet of water near the can at the Cement Plant. No salmon to report. Walleye have been caught at night in the channel. Try crawlers and leeches on crawler rigs or a single hook, artificial minnows or crank baits. Smallmouth bass were caught on crawlers or leeches. Lake herring were taken on small blue and grey spoons in the evening. Carp and pike were seen off the end of the North Pier. Lake Charlevoix: Had reports of smallmouth bass on the beds in seven to eight feet of water. The walleye had their bellies full of mayflies. Traverse City: The East Bay has good smallmouth action. Try tube baits or other plastics that mimic gobies or crayfish. Lake trout were caught in 35 to 110 feet of water. The West Bay is producing lake trout, cisco and smallmouth bass. Most of the lake trout were caught by those jigging in 100 feet of water. Elk River: Is still producing good numbers of smallmouth but many were sub-legal. Boardman River: Is producing a variety of fish including smallmouth bass, pike, rock bass and carp. Go with leeches or plastic baits. Frankfort: Chinook salmon are starting to show up in 120 to 220 feet of water. Anglers are fishing 45 to 90 feet down along the Shelf. Early morning is best with blue magnum spoons. Lake trout were caught near the bottom in 80 to 120 feet with cowbells. Those heading out 12 to 16 miles have caught steelhead near the surface. Onekama: Anglers reported Chinook salmon straight out in 100 to 220 feet of water. Most are trolling 40 to 100 feet down with flies and spoons. Portage Lake: Bluegills, rock bass, perch and pumpkinseed are hitting on crawlers along the weed beds and the drop-offs. More bass have been caught now that the mayfly hatch is done. Walleye were taken on crawler harnesses. Manistee: Fishing has not been easy. A few Chinook were caught 45 to 100 feet down in 100 to 200 feet of water with orange spoons and meat rigs. A couple steelhead and lake trout were also caught. Manistee River: A few summer-run steelhead have been caught below Tippy Dam. Small brown trout were caught between M-72 and the CCC Bridge. Salmon were reported as far up as the Nine Mile Bridge in the Little Manistee. Ludington: Salmon fishing continues to be slow. A few trout and salmon were taken 45 to 120 feet down in 80 to 180 feet of water. Most are using orange or green spoons with meat rigs. Pentwater: Has baitfish close to shore. Pier and channel anglers caught freshwater drum or the occasional bass. Boat anglers reported large schools of trout and salmon in both shallow and deep waters. A couple steelhead or small Chinook were caught in 40 feet of water north and south of the pier. Those trolling 50 to 100 feet down in 170 to 200 feet caught Chinook and coho. Pentwater Lake: Walleye and large panfish were caught on crawlers or leeches. Keweenaw Bay: Catch rates for salmon were fair for those trolling 25 to 100 feet down in 150 to 240 feet of water between Sand Point and Carla’s. Try spoons and flies. From the South Portage Entry, lake trout were caught by those jigging near Farmers Reef, Newton’s Reef and Big Reef. Chinook, lake trout and coho were caught when trolling south towards the Red Rocks and the Roadside Park. Try 30 to 45 feet down in 40 to 50 feet of water. Anglers did well for lake trout near Hermits Cove, the Gay Stacks, Big Louie’s Point and along Five and Six Mile Reefs. When trolling, target 130 to 160 feet or 130 to 220 feet when jigging cut bait. Lake Gratiot: In Keweenaw County had good walleye fishing in the evening. Most of the fish caught were in the 15 inch range. Craig Lake: In Baraga County was producing some large crappie off the State Park. Marquette: Had good Chinook and coho salmon action. No limits but anglers are picking up four or five coho and the occasional Chinook weighing up to 14 pounds outside the Lower Harbor breakwall near the “Green Can” and near Shot Point in 50 to 70 feet of water. Lake trout action was good near the “White Rocks” and near Sand Hole. A couple coho were caught on high-lines about 20 feet down in 200 feet of water. Stannard Rock has been good for those jigging for lake trout. Areas near the Chocolay River and Shot Point had slightly warmer water temperatures. Menominee River: Is producing walleye, smallmouth, rock bass, channel cats and freshwater drum. The walleye were smaller but some nice smallmouth bass have been caught by those trolling crank baits or crawler harnesses. Shore anglers are drifting crawlers and minnows or casting crank baits. Cedar River: The smallmouth bass fishing has been phenomenal with fish 20 inches and bigger being caught by those casting rapalas or drifting crawler harnesses. A couple pike have also been caught. Little Bay De Noc: Walleye anglers had fair catches with the hot spot near Breezy Point when trolling crawler harnesses in 10 to 18 feet of water along the drop-off. Fish were caught along the “Black Bottom” in 14 to 20 feet and along the Kipling Reef when trolling crawlers in 12 to 23 feet. Perch fishing was fair along the Kipling Flats and south of the “Narrow”. Try still-fishing with crawlers or minnows in 18 to 30 feet. Big Bay De Noc: Had good walleye fishing for those trolling or drifting crawler harnesses in 16 to 23 feet of water around the “Boot” and Ansell’s Point. Ogontz is still producing smallmouth bass when trolling or casting crank baits, plastics or minnows in three to 14 feet. A few perch were caught in Garden Bay when drifting or still-fishing crawlers in eight to 12 feet of water. At Fairport, a few boats were starting to get some fish when trolling spoons in 45 to 110 feet of water. Au Train: Success rates for lake trout were mixed with anywhere from no fish to five fish caught. Some were lucky enough to catch the occasional Chinook or coho. Most were using spoons along the east shoreline near the Au Train River or Shelter Bay. Near shore water temperatures were in the low 50’s and the offshore waters were still averaging the mid 40’s. Manistique Lake: Is producing some bluegill and a few pike. St. Mary’s River: Is producing northern pike in Raber Bay and near Lime Island. Anglers are trolling crank baits in five to seven feet of water. Fair to good walleye action near the mouth of the Gogomain River when trolling small crank baits or crawler harnesses in three to four feet. No word yet on lake herring. Boat anglers need to be careful and watch for rocks and sand bars along the river and near Drummond Island. DeTour: Anglers are trolling from the city launch out to the #3 Green Can, around the lighthouse and over to the #2 Red Can near Drummond Island. Some boats are venturing three miles further to the south and fishing around the flats. Early morning was best for Atlantic salmon, Chinook salmon and lake trout. Hot colors were orange, watermelon and green. Good walleye fishing around Swedes Point for those using minnows with slip bobbers. Drummond Island: Walleye fishing was slow however rock bass and channel cats were caught on worms in five to seven feet of water in Maxton Bay. Cedarville and Hessel: Northern pike fishing is good in the Les Cheneaux Islands. Try minnows or chubs in six to 10 feet of water. Large and smallmouth bass have been caught in Hessel Bay, Musky Bay and Snows Channel when casting or trolling. A few more perch were caught in Hessel Bay and Cedarville Bay. The mayfly hatch is in full swing so catch rates tend to go up and down. St. Ignace: A handful of anglers were out targeting Chinook and lake trout on the backside of Mackinaw Island, along the flats and between the old fuel tanks and the Coast Guard Station.